The book contains eleven chapters, an appendix of suggested native plants, and a useful glossary of terms. The first three chapters establish Stibolt’s argument for the efficacy of only-native gardening, while also dispelling myths such as the “no maintenance landscape.” Chapter 3: “Invasive Exotics” describes the economic and environmental costs of Florida’s invasive plants, offers a catalogue of common invasive species and suggested native alternatives (alter-natives, as Stibolt calls them) with which to replace each of them. For instance, Stibolt recommends replacing mimosas with Eastern redbuds or, in tropical South Florida, coco-plums. Later chapters provide strategies for selecting, planting, and maintaining a garden or landscape of native plants. For example, Chapter 7: “Minding Your Edges,” outlines how gardeners can manage their native gardens/landscapes so as to remain in harmony with neighbors’ lawns, gardens, and farms. Illustrations (mostly photographs, but some drawings as well) help to sell the charms of a native garden by displaying the natural beauty of Florida plants. While most of the photographs are in black-and-white, a small gallery of color photographs in Chapter 8: “Managing Freedom Lawns, Lawn Replacements, and Meadows” highlights the vivid colors and striking shapes of native flowers and grasses, such as Florida’s state wildflower the yellow tickseed, purple blazing-stars, and the pink hairawn muhly grass, the last of which I’ve always known (without knowing their name) as the beautiful shocks of colorful grass growing along the medians of I-10. The appendix is split into two sections: the first serves as an alphabetical guide to various native plants and how best to maintain them, while the second details types of mulches and their utilities. Among my personal highlights from the glossary are “propagule” (general definition for a plant part that can grow into a new plant, which would include seeds, spores, and cuttings), “freedom lawn” (a lawn without pesticides, without fertilization, and without over-irrigation, only mowed during the plants’ growing season), and “snag” (a dead tree left standing for the benefit of wildlife such as birds). With her strategies, advice, and illustrations, Stibolt celebrates the state’s native plants and provides roadmaps for readers to honor Florida’s native ecosystem in their own gardens and landscapes. Jonathan Louis Duckworth is an MFA student at Florida International University and a reader for Gulf Stream Magazine. His fiction, poetry, and non-fiction appears in or is forthcoming in New Ohio Review, Fourteen Hills, PANK Magazine, Literary Orphans, Cha, Superstition Review, and elsewhere. It is no secret that vegetable gardening in Florida can feel like a haphazard pest-guessing game of who eats what. Certainly, in my experience in South Florida, the truth is that I usually end up eating nothing – the nematodes, insects, birds, raccoons, possums and fungi all get to it before there is any kind of harvest. Because I live on an ocean-access canal, I am especially interested in preventing runoff of fertilizers and other chemicals into our waterways, and am committed to natural, organic management of my yard, yet there are few resources that address organic gardening methods for our fair state. Organic Methods for Vegetable Gardening in Florida by Stiblot and Contreras is a handbook for Florida gardeners who are committed to, or at least interested, in organic gardening methods that will actually work for our horticulturally complicated stated. This is an ambitious topic. Stilbot and Contreras write, “Our state’s seven distinct USDA plant hardiness zones make covering gardening in all of Florida a special challenge. Most vegetable gardening books (organic or not) are of little use in Florida because 'the rules are different here,' and furthermore, the rules in Pensacola are different from those in Miami.” This is something that most Florida gardeners understand, and this book fills a gap in information that we all long for when we pick up generalized gardening books. The text offers an innovative look at modern organic methods that can be applied to the specific issues generated by Florida’s climate, including issues with soil and sun, two forces that often cull ambitious new gardeners within a season or two, and issues with weeds and pests, which have the potential to quickly ruin a Florida garden. The text is organized logically and chronologically, offering first a brief overview of what organic gardening is, then a start-to-finish look at the gardening process, from siting and planning a garden, to harvesting crops and preparing the soil for next season’s plantings. The chapter on siting and arranging the garden is particularly helpful. It includes sections on vertical gardening, raised bed gardening, which is a must in Florida, companion planting, intercropping, straw bale, and self-watering container gardening. Helpful illustrations make it easy to visualize the set-ups, and many of these designs can be used in small spaces. Forty-eight pages of high-quality photographs also illustrate a variety of real gardens, crops, plant varieties, beds and growing areas, as well as organic soil-preparation techniques and companion planting. What’s missing from the guide are visual aids or charts that help classify the wealth of information, such as a seasonal crop guide that addresses Florida’s growing regions. Also, it is difficult to learn the difference between pests and natural pest killers without illustrations. There is a chapter on ecosystem gardening which addresses implementing positive practices, such as attracting and keeping natural pest killers, but novice gardeners may not know the difference between a pest and a beneficial insect without an illustration. As well, I found myself looking for specific, user-friendly lists of organic pest management and organic fertilizer, especially since Florida gardening seems to be so plagued by a great variety of pests. My go-to reference for natural fertilizers and organic pest management has always been Rodale’s All New Encyclopedia of Organic Gardening, which has charts and drawings of root and leaf symptoms as well as a helpful chart of common home organic fertilizers. Most of the information in this handbook seems to apply to many, if not all of Florida's variety of hardiness zones. However, due to Florida’s varying differences in growing conditions and weather, I felt the need for specific gardening tips for different climates. It would be especially helpful to have more information specifically for gardeners in zones 10 and 11, which includes most of Palm Beach County, on down through the Keys, as these zones are rarely addressed in general gardening books, leaving readers hungry for specific zone information. Despite these few minor shortcomings, this book is an important resource. Until recently I believed there were more obstacles than opportunities in Florida vegetable gardening, but Stibolt and Contreras have given me hope that the opposite may be true, even way down here in Zone 10, where the nematodes seem to have their own cultural presence. In a place like Florida, with so many growing obstacles, this organic gardening guidebook is especially valuable. D.S. Davies was raised in Fort Lauderdale. She is the recipient of the 2013 Betty Gabehart prize for nonfiction. She has been published in Real South Magazine and currently lives in the real South—Zone 10. Florida is a land of transplants. Even our state flower, the orange blossom, was imported by the Spanish. 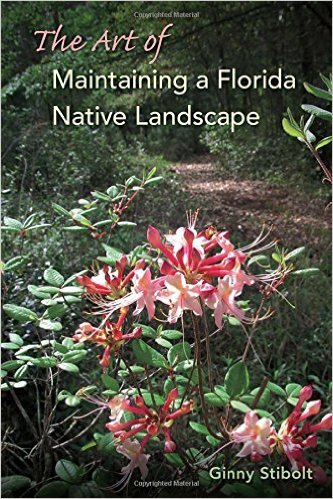 In Native Wildflowers and Other Ground Covers for Florida Landscapes, ecologist Craig N. Huegel, the co-founder of the Urban Wildlife Program at the University of Florida, offers a guidebook for gardeners who wish to recreate a native landscape. Huegel writes, "We have tried to make this place something it isn't and ignored virtually everything it is. In doing so, we have destroyed the sense of place that makes us unique and created a bizarre caricataure of nothing." There is a growing movement among ecologically-minded gadeners to use native plants in landscaping because they will support the native fauna of that region. The problem with determining what is native to Florida and what is non-native is that for the past 500 years people have been introducing plants to Florida and the first arrivals from Spain kept poor records of what they found here. The book is organized by three herbaceous plant types: ferns, grasses, and wildflowers. Easy to read, it includes vivid, colorful photographs, though not every plant described in the book has a corresponding image. Huegel explains how to obtain plants for your landscape from where they naturally occur, and how to propagate them once you have stock. Taking plants from the wild in Florida is a complicated issue, though. A number of laws protect native plants. While it is possible to obtain a permit to gather plants on public land, Huegel discourages this practice. Many of our native plants are endangered, and removing them from where they naturally thrive for home gardening is often harmful to the delicate native ecosystem. Huegel suggests instead that the best resource may be your local small-scale gardening center. It's important to consider the climate zones within Florida. Plants that do well in the subtropical zone of southern Florida may not withstand the more temperate weather of the Panhandle region and vice versa. Even seeds for plants that are native to Florida can fail to thrive if obtained from a commercial greenhouse in the north. Huegel does not organize the plants by where they grow within the state, though that information is included for the reader within each plant description. Also included are the types of soil each plant prefers. One chapter explains some of the approaches to planning a native plant landscape. Native wildflowers tend to be understated. These are not the showy hothouse flowers bred to be breathtaking, though there are a few notable exceptions like the Pine Lily, a brazen brick-red but temperamental flower that produces one four-inch bloom a year—if it blooms at all. Another notable flower is the Sunshine Mimosa, a creeping ground cover so common throughout Florida that it is easily overlooked, despite the pink powder-puff flowers honeybees and butterflies find irresistible. Two thirds of the plant types included in this book do not flower but are useful for preventing soil erosion and for providing groundcover. These plants may not thrill the neighbors, but should attract native birds and butterflies hungry for homespun nectar or seed. Native Wildflowers and Other Ground Covers for Florida Landscapes is a useful resource for a very specific type of gardner. Where traditional gardens have beds that must be weeded and mulched, with plants that grow in neat rows, a natural landscape typically requires allocation of a greater amound of space and may not be as colorful or as tidy. Once established, a native landscape requires less maintenance and irrigation than a traditional garden. This is an ideal choice for the gardener who lives in an area with watering restrictions or for someone who doesn't enjoy mowing the lawn. This book may not be a good resource for an urban gardener who is limited to a container garden, or for someone who lives in a condo with landcaping restrictions. The book is not intended as a field guide for naturalists who wish to identify native plants, but it does include in the appendix recommendations for field guides, along with a list of other resources for information on native plants. Jan Becker is an MFA candidate at Florida International University. She is the nonfiction editor for Gulf Stream Magazine. After having resided in many different climate zones in the contiguous United States and Hawaii, she now lives in Pompano Beach, FL (Zone 9). Her writing has appeared in Sliver of Stone Magazine. I walk now for miles in the hammocks and flatwoods, the marshes and swamps of Florida. I walk to discover new things, and to remember in my heart the ones I once found. I walk in celebration of discovery, and in the evocation of people and place. I walk to remember. Unlike Belleville’s previous work, Losing It All to Sprawl, which documented his ten years staying put in a Cracker house in Sanford, these 47 short essays (some no longer than two pages) cover much land and water in Belleville’s adopted state. In the first essay, Belleville kayaks with friends after dark in search of bioluminescent plankton. Crabs drift along, glowing, sometimes bumping into my hull, hard calcium shells clanking oddly against plastic. Alex cups her hand in the water, and the liquid she holds sparkles as if electrified. In the distance, a dolphin arches out of the water, bringing a massive column of light with it. I know, intellectually, that tiny, single-celled plankton called dinoflagellates do this, absorbing energy from the sun and releasing it to confuse predators at night, twisting and turning in the water. But that doesn’t explain the full magic of it to my senses. In “Following the Unseen,” Belleville ruminates on taking the path less travelled. The best way to keep folks from poking about places like this is to simply leave them off the public map. And so, the unmapped parcel is always my choice: It’s seldom used by other hikers; it offers a better chance to see wildlife—or at least signs of them; and, it allows you the opportunity to get lost. Although the shortest essays sometimes feel like anecdotes, some of the longer chapters are particularly moving. In “The Wekiva,” Belleville paddles up the Wekiva River, where “bald cypresses—the ones that were too small to be logged a century ago—endure with a sort of timeless resolve.” Belleville finds that, after years of heavy RV use, the river basin is recovering. It is a restoration story. Despite decades of damage, if we give enough time and space, places like Wekiva can heal themselves. Belleville is at his best when he captures on the page his wonder and love for wild places—sand pine and saw palmetto, sawgrass sloughs, coral reefs. But it is also refreshing when he offsets a string of essays about place with one about people. Tree exists for now in a little time warp, insulated by the remoteness of place. . . a true American river character, maybe what happens when Huck Finn goes to war and then comes home as a mad-sane drunken shaman. While there is no clear narrative thread in this collection, several themes recur in the essays—dream versus reality; nature as sacred space; the myopia of human Progress. Belleville draws links between present Florida and the one that naturalists like William Bartram, Archie Carr, and Marjorie Stoneman Douglas wrote and advocated for in decades past. This is a smart, knowing collection that sheds light on Florida’s lesser known natural wonders. Belleville takes the reader to places that most people figure are already gone. He reminds us that all is not lost; there are places worth being found. We only have to know where and how to look. Justin Bendell lives and writes in Miami Beach. The last Caribbean monk seal in Florida was caught off Key West in 1922. By that point, seals were a rare novelty, and crowds lined up on the beach to see the seal’s carcass. Twenty years earlier, a few seals had been kept in a moat on the Dry Tortugas. Two hundred years before that, seals were frequently sighted off the coasts of Florida, plus in a range from Nicaragua to North Carolina and Texas to Trinidad. But by the middle of the twentieth century, they had gone completely extinct. What happened to the seals? In Caribbean Monk Seals, John Hairr tells the story of their life and death. Caribbean Monk Seals is largely targeted towards those with scientific interest in the seals, and so there is a lot of data included on classification, relative skull sizes and shell pit locations. While the data can be dry, there are occasional entertaining tidbits, like the whimsically named 1836 magazine Journal for the Bahamian Society for the Diffusion of Knowledge. There are a number of interesting and detailed maps, dating back as far as the seventeenth century. The book contains interesting information about the archaeological evidence for seals from the pre-Columbian period, especially among the Maya. Evidence is rare and often misinterpreted (as with a Mayan carving of a seal which was at first misidentified as a peccary), but a picture does emerge about the way native peoples and monk seals interacted. Archaeological evidence and written reports indicate that among the Maya, Calusa and other peoples of the Caribbean, seals were only eaten by the elite members of society, as they were considered a delicacy. Seal teeth and bones were also used for jewelry and ornamentation. Still, both before and after Columbus’ arrival, the main interaction between humans and seals was a negative one, with an increase in humans resulting in a dramatic decrease in seals. The opposite is also true: when many of the native people of the Caribbean perished after Europeans first arrived, monk seal populations actually increased as their main hunters, the natives, disappeared. This trend quickly reversed, however, once European colonists began to hunt the seals in great numbers. Originally seals were hunted for food, but later seal oil was used in lamps, much like whale oil. Even scientists of the nineteenth century killed scores of seals in order to study them, failing to focus on their preservation in a period when “naturalists were as renowned for their skill with a rifle as they were for their writing.” By 1900, seals had almost completely vanished, and rarely appeared except in the most isolated parts of the Caribbean and Gulf of Mexico. Despite being extinct, the seals have left relics of their existence. Numerous locations in the Caribbean region are named after them; Seal Cays exist in Belize, Nicaragua, Anguilla and the Bahamas, for example. Hairr writes that he has hope for another legacy of the monk seals, that they will represent why it is important, as we study endangered species, to work, as well, to preserve them. James Barrett-Morison is a college student in Massachusetts who hails from Miami. He is also a Contributing Editor of The Florida Book Review. 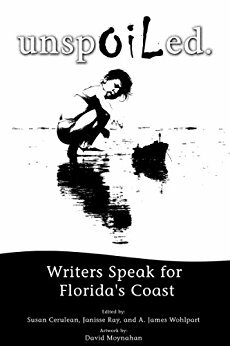 Literary advocates for the continued preservation of Florida’s coasts unite in Unspoiled, Writers Speak for Florida’s Coast. The collection of moving essays, short stories and poems by 38 writers includes a wealth of information for anyone interested in the splendor of the gulf and its ecosystem. It is also a treasure trove of bold statements that cast a suspicious eye on Big Oil and Big Development. The tales tell the trickle-down effect that bad environmental decisions tend to have on land and sea dwellers alike. The essays also accurately portray the inimitable splendor that is Florida’s gulf coast and the imminent threats to its longevity in the form of proposed offshore drilling and avaricious developers. With financial support from the Center for Environmental and Sustainability Education at Florida Gulf Coast University, the project was initiated in Fall 2009 in response to discussion of lifting the ban against drilling off Florida's coast. It was published after the Deepwater Horizon spill, when the alarms it raises have become all the more urgent. From fishermen to professors to reporters and students, every author in Unspoiled has a story to tell. They range from the personal, like Lola Haskins' poem, “The View From Cedar Key,” where she captures her feelings about the possibility of oil drilling off Florida’s gulf coast, to Diane Roberts' “Selling Florida,” an essay in which she delves into the political side of the same issue. Well, now we know who you have to sleep with to get Florida’s ban on drilling repealed. The anthology’s editors did an impressive job of interspersing the serious stories with the lighthearted—the political arguments with the personal stories—in such a way that reading Unspoiled is not only enjoyable, but balanced. The book is informative, yet playful, tackling serious issues while reminding us of the reason why they need to be addressed. Deb Alberto is a Miami native and former journalist who is pursuing her MFA in Creative Writing at Florida International University. 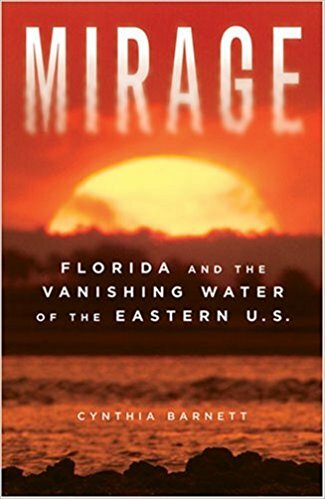 Mirage: Florida and the Vanishing Water of the Eastern U.S.
Cynthia Barnett begins her tale of Florida's water with the story of David and Vivian Atteberry, two Illinoians who retired to the Orlando area. Within a year, their home began to crack and break apart—it was falling into a giant sinkhole. They were forced to abandon ship (or house) and moved back to Illinois. Barnett expertly and effortlessly transitions from the Atteberrys' tale to science, explaining how a lack of groundwater increases the rate of sinkhole formation in southern and western Florida. In Mirage: Florida and the Vanishing Water of the Eastern U.S., Barnett links characters and environmental history, looking at well-known players like Henry Flagler, Walt Disney and Bob Graham, but also others we don't expect. I never knew that Harriet Beecher Stowe, after the Civil War, moved to Florida and acted as an advertiser luring northeasterners to Florida, becoming effectively the originator of the Florida snowbirds. Who is to blame? Politicians, even those who view themselves as environmentalists, are forced by the electorate to support both the environment and growth in what Barnett calls the “Florida politician's Janus pose.” Developers and businessmen share culpability, as does the Army Corps of Engineers, which has its own Janus pose: many of its environmental projects seek to counter the effects of its other projects, like restoring beaches eroded by earlier Corps actions. The Corps were placed in charge of wetlands permits in Florida, supposedly in order to help protect the environment. But between 1999 and 2003, they granted more than 12,000 permits, and rejected only one. After the wars and inefficiencies of the first three-quarters of the book, the last few chapters take a more positive turn, looking at possible solutions like conservation efforts and desalination plants. These are difficult and expensive ways of quenching Florida's thirst. But the real refrain is best summed up by schoolteacher Elizabeth Falcone at a Boca Raton water-conservation meeting: “The bottom line is, too many people.” If present trends continue, Florida will grow by 21% and surpass New York to become America's third-most populous state within fifteen years. Without these new arrivals, Barnett argues, the water troubles would be much more manageable. But what will stop them? Even David and Vivian Atteberry, who fell into the sinkhole, still dream of living in Florida. Is Mirage one chapter in a horror story or a turning point? With books like Barnett’s, no one can plead ignorance. James Barrett-Morison is a contributing editor at The Florida Book Review.